Championship-winning athletes stick to their game plan despite what the competition is doing, think independently when necessary, keep persevering, and pounce when opportunity knocks. BimmerWorld Racing’s James Clay and Devin Jones showed all of those attributes in Friday’s season opener for the IMSA MICHELIN Pilot Challenge series and came away with a solid fourth in the BMW Endurance Challenge at Daytona International Raceway. The finish was a thriller, as their car advanced three positions in the last three minutes of the four-hour race. James Clay, of Blacksburg, Va., started ninth. He stayed at the controls of his Dublin, Va.-based team’s No. 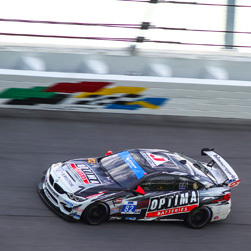 82 OPTIMA Batteries/Veristor BMW M4 GT4 for the entire first half of the race, despite watching his main rivals peel into the pits during three of the race’s nine caution flags in an attempt to gain an advantage with their teams’ strategies. He stuck to his guns and didn’t let them affect his team’s master plan, and he also dealt with an unusual power problem with the No. 82. Clay made two pit stops under yellow flags on lap 18 and 30, had a tremendous battle with Austin Cindric, stayed out of trouble even when Fred Poordad spun in front of him, and was eighth when he pitted for Jones to take over under the fifth yellow with 2:01.40 remaining. Devin Jones, of Mooresville, N.C., was unable to get a good rhythm going initially due to more caution flags. He also had to deal with the major disadvantage of no radio contact with the pits and its spotters through his entire stint. But the series’ 2018 Street Tuner co-champion responded like the champ he is, setting the car’s fastest lap of the race on lap 77 with a time of 1:53.792. Jones led laps 78 and 79 before the team requested a black flag be displayed to signal him to come in for his final pit stop for fuel and a set of fresh Michelin tires on lap 80. The stop put Jones back in 19th place, and at one point he was a lap down, but once again the team stuck to its plans and kept digging. Jones was 15th with 30 minutes remaining, and he was 12th when the final full-course caution flew with 15:29 left. He had a great car under him, but with three minutes left, Jones was still in seventh place. He wasn’t done passing cars, though. In 6th with just 1:19 to go, Jones took advantage of the two cars battling ahead which gave him the massive Daytona two-car draft in the last turn of the last lap before taking the checker about a nose ahead of the other two, nailing 4th-place when the checkered flew on lap 101 for the thrilling finish. A second BimmerWorld BMW M4 GT4 driven by Kaz Grala of Westborough, Mass. and Aurora Straus of Cold Spring, N.Y. started 16th but cut a tire very early in the race and had to spend a great deal of time in the pits and the garage for repairs. The team worked hard to get the car back into the action, and both drivers got some time behind the wheel. Their car, sponsored by Richard Mille watches and Straus’s Girls With Drive program, was credited with a 30th-place finish in the Grand Sport class. Straus set that car’s fastest lap of the race with a 1:54.847 on lap 57. Friday’s race will be shown on NBCSN from 1 p.m. to 3 p.m. Eastern on Wednesday, Feb. 6. This race supported the Rolex 24 at Daytona. The next event will be held March 13-16 at Sebring, Fla., as part of the Mobil 1 Twelve Hours of Sebring weekend. “We had a tenth-place qualifying and the car had better in it. But then at the start of the race, there was something wrong with the power. Last year here we had a good car on the straights, and we were pretty much lining up and passing people. There wasn’t a single car I could even hold on to in the draft today. “We reset after the first stint, and we feel like it got better, or we think there was some sort of ECU compensation or something going on. We’re going to dig into it. Obviously, towards the tail end of the race, we had the power and could hang with cars on the straight. Devin did an awesome job with that last few laps and last-lap pass. We didn’t have a fourth-place car today, but we had a team to pull out a fourth-place finish out of a top-10 car. So this was just a super way to start the season. If you’re not going to win it, this is OK too. “This was a really wild race! James did a good job managing the car at the beginning and keeping it right where we needed to be. Our pit strategy worked out well, but I had no radio communication the whole time, so I was out there by myself. That made it kind of difficult to judge when I needed to come in. “I was thinking I needed to come in at the same time they threw the black flag for me because I was watching the gauges. I barely knew it was the white flag [last lap], and I tried to time it right to get around those last two cars at the end and it worked out. 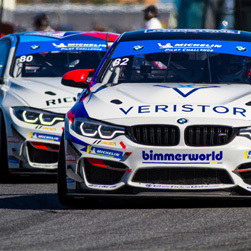 The only constant in life is change, but BimmerWorld Racing hopes to begin the 2019 season like it finished 2018 — on the top step of the podium in the top class in what is now the IMSA MICHELIN Pilot Challenge series with the introduction of the new Michelin tire for 2019. 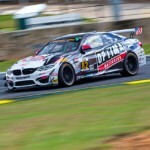 The Dublin, Va.-based team will field two BMWs in the top Grand Sport (GS) class in the 2019 season opener after finishing third in the GS championship last year and winning the Street Tuner (ST) championship. Team owner James Clay of Blacksburg, Va. will co-drive with one of those ST champions, Devin Jones of Mooresville, Va., in BimmerWorld Racing’s No. 82 OPTIMA Batteries/Veristor BMW M4 GT4 this season. With a full year of development work on this car behind it, BimmerWorld has high hopes for a great finish in the season opener, the four-hour BMW Endurance Challenge at Daytona International Speedway this Friday afternoon, Jan. 25. It’s a companion event to the 57th annual Rolex 24, which begins the following day. 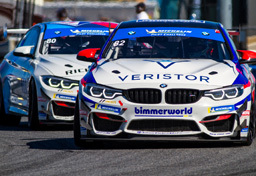 Besides winning the pole and the race in the ST class last year at Daytona, BimmerWorld finished second in GS in the season opener in the GT4’s debut a year ago, and it won the season finale in GS at Road Atlanta last October. 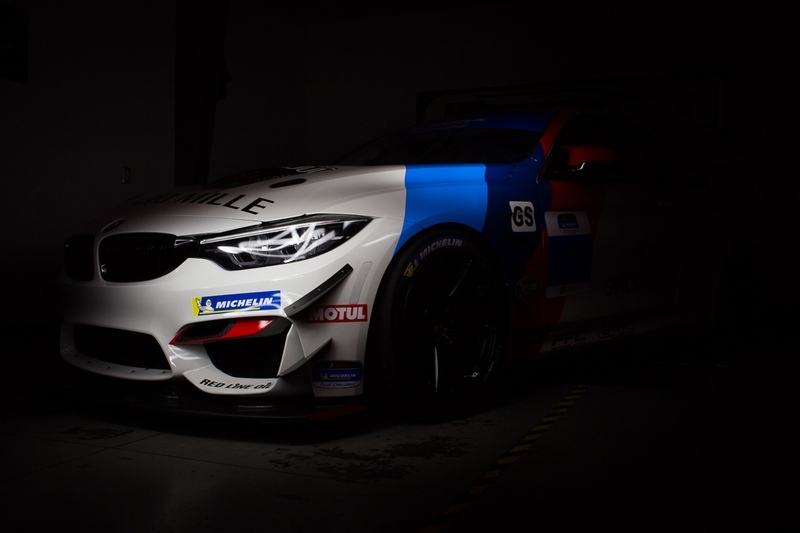 A second BMW M4 GT4 in the BimmerWorld garage at Daytona will carry the No. 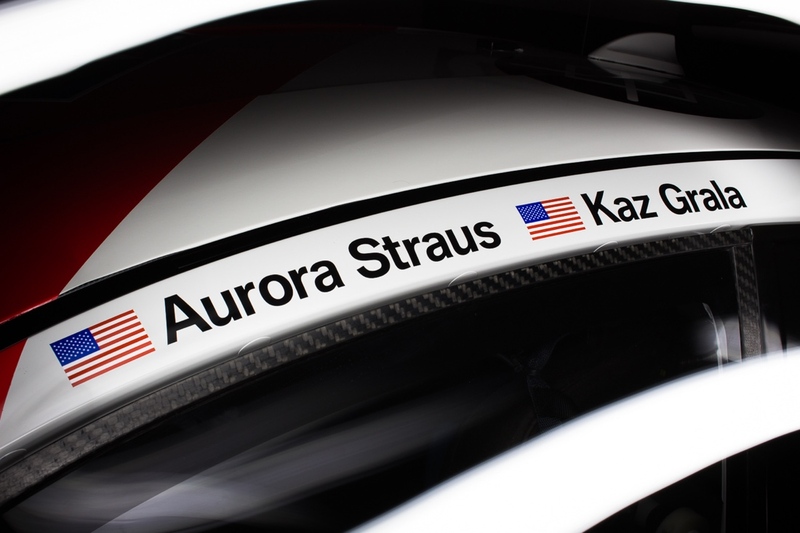 80 and have the names of two 20-year-olds, Aurora Straus and Kaz Grala, over its doors. Straus, of Cold Spring, N.Y., finished second in the Pirelli World Challenge’s GTS SprintX-Am class last year in another BMW M4 GT4. Stock car fans will remember Grala won the NASCAR Camping World Truck series race at Daytona in 2017 at the age of 18. Sports car fans may recall that this driver from Westborough, Mass. finished fourth in the GS class in a BMW M3 in the Continental Tire SportsCar Challenge race at Daytona in 2014 shortly after he turned 15. He’ll be back at Daytona on Feb. 16 for the NASCAR Xfinity race; he finished fourth in that race last year. 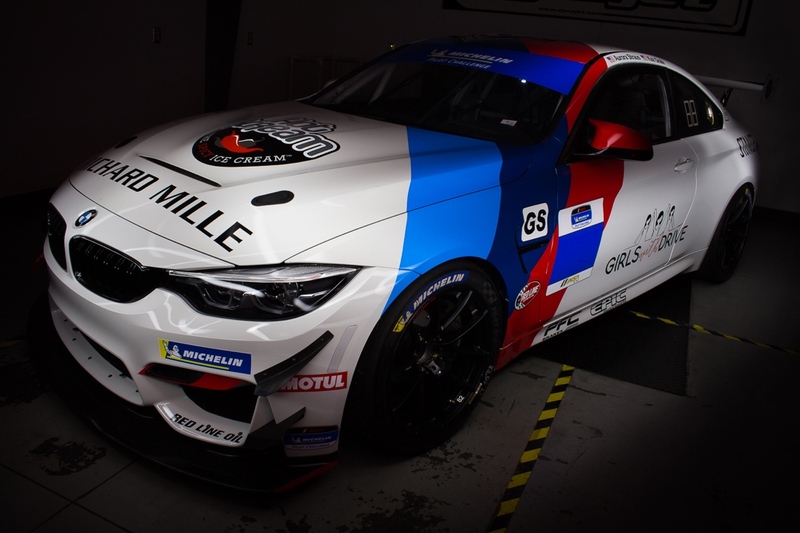 Straus and Grala’s BMW will bring sponsors Richard Mille watches and Straus’s Girls With Drive program, which encourages girls interested in male-dominated careers. The duo’s participation with BimmerWorld was spearheaded by another driver that IMSA fans know well — veteran driver Nick Longhi. Jones, who is only four years older than the drivers of the No. 80, has fond memories of Daytona’s 3.56-mile speedway road course. His victory in this race last year was his first one in this series, and a huge milestone for a kid who first came to the birthplace of stock car racing in 2004 to run a go-kart. Clay, 45, is the veteran of the group taking his 10th Daytona start this week, and he’s already thinking about race strategy. “Our team finished on the second step of the podium in our first race with the new platform last year, and fielding a strong and capable two-car effort will multiply our chances at this draft-critical track to stand on the top step,” he said. The season opener is one of only two four-hour races on the 10-race schedule, as the typical format is a two-hour event. Thursday will be busy, as there are practice sessions at 9 a.m., 11:40 a.m., 2:45 p.m., and 5 p.m. before the TCR class qualifies at 5:25 p.m. and the GS class’s starting lineup is determined in its qualifying session at 5:45 p.m. There will be a 20-minute warm-up the following day at 9:20 a.m. before the open-grid fan walk begins at 11:15 a.m. The field will warm up its Michelin tires at 12:05 p.m., and the race is scheduled to start at 12:15 p.m. The event will be streamed live on imsa.tv, and there will be live timing and scoring on imsa.com. The race will be broadcast on NBCSN from 1 p.m. to 3 p.m. on Wednesday, Feb. 6. All times are Eastern. 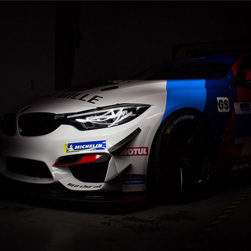 In what key areas have you developed the BMW M4 GT4 last year and in the off-season that should make it even more competitive in 2019? How big of a deal is the change to Michelin tires? Your team won the ST championship last year, and now it has two cars in the GS class at Daytona. Is running two cars in the same class easier than running two cars in different classes, does it make it harder, or is it just different? How did the Roar go? How optimistic are you going into this race and into this season? The BMW M4 GT4 is very different than the BMW you drove last year in ST. What are the biggest things you have to get used to? How much confidence did winning the ST championship last year give you? In what ways are you a better driver now than you were at this point last year? What do you think is the biggest key to doing well in this race? It’s been 14 years since you first came to Daytona to run a go-kart. Knowing what you know now, what would you tell your 10-year-old self? You ran a BMW M4 GT4 last year, but in an entirely different series. What will it be like to run it at Daytona? What is the biggest thing you feel you’ll need to concentrate on at this event? Are you doing any promotions with the Girl Scouts at Daytona? If so, would you please tell us a little about it? How excited are you to be doing this race? This is your first time co-driving with Aurora, but you’re long-time friends. In what ways are your driving styles similar, and what do you think will be your main advantages as teammates? You’ve been in the Rolex 24 and other sports car races, yet you are concentrating on a stock car career. How will running a sports car at Daytona in January help your stock car effort here in February? You didn’t participate at the Roar. 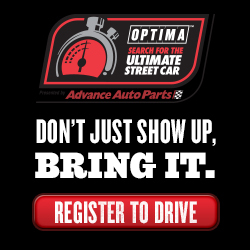 Have you tested the car anyplace else, or will Thursday at Daytona be your first time in it?